John Chemsak is the most eminent specialist in systematics and faunal studies of longhorned beetles (Cerambycidae) of the Western Hemisphere. 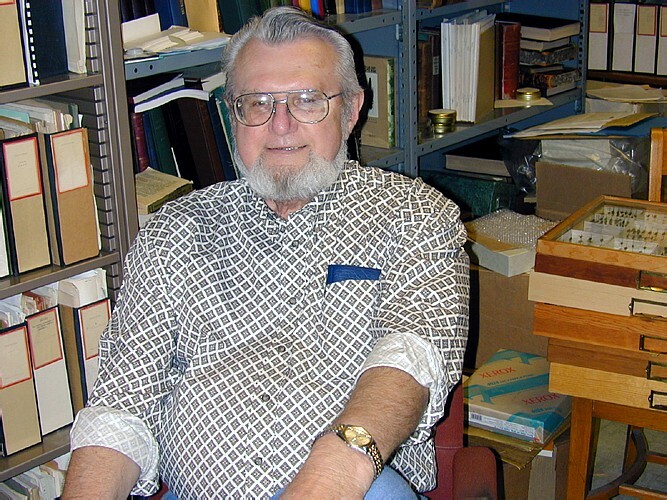 He has written five volumes of the fundamental work "Cerambycidae of North America" and two large catalogues in co-authorship with E. Gorton Linsley. Now he has been publishing the new "Illustrated Revision of the Cerambycidae of North America" in many volumes. He has published more than 150 scientific works, more than 500 descriptions of new species and over 60 new genera. John has never been in Russia and we have never met in person. But I regard him as my closest foreign colleague. We have been in correspondence for many years exchanging dozens of letters and carefully prepared parcels with collection material on beetles. Our cooperation developed successfully throughout these years. As a result I have a representative collection of longhorn beetles of North and Central America, and John has obtained quite a complete collection of members of this family from the territory of the former Soviet Union. When I started working at the Zoological Institute I gave my collection to the Coleoptera Department. Now the specimens sent by John are available to every specialist and can serve scientific research for an infinitely long time. John's contribution to our collection is particularly valuable because he sent already mounted specimens provided by his own identification labels. As a result we now have a vast collection of material identified with the highest degree of accuracy by the main specialist in North American fauna. John was born in 1932 in Pennsylvania. He spent four years of his early childhood in Slovakia, the native land of his parents, and returned to the USA just before World War II. His almost entire scientific research activity is associated with the Essig Museum of Entomology at the University of California in Berkeley. John retired in 1995 (his last position was Curator at the Museum). However he continues working actively. His office at the Museum is retained for him and he visits the museum regularly. He continues describing new species and goes on expeditions to Mexico and Central America (new species of longhorn beetles are now being described mostly from that region, because fauna of North America has been sufficiently completely studied, to a large extent owing to the long-term research conducted by John). Not long ago he visited even Papua New Guinea. However that trip was overshadowed by malaria he got there. The prominent American entomologist E.G. Linsley, who was John Chemsak's mentor and friend, passed away in 2000 at the age of 89. One half of the volumes of "Cerambycidae of North America" were co-authored by them. Now John works on the Mexican and Central American fauna with his disciples - American Frank Hovore and Mexican Felipe Noguera. Our correspondence was interrupted by John's work on the last, most difficult volumes of the monograph: the subfamily Lamiinae conceals a great number of taxonomic problems. Our contact has been restored, now on a different level, i.e. by means of electronic mail, owing to my work on our site. I am extremely happy that our contacts have been revived and wish by dear colleague John Chemsak from the bottom of my heart many years of active creative work.